“Good Wins! Good Wins! Good Wins!” Such were the tweets and posts that littered my social media walls following the Denver Broncos most recent routing of the Pittsburgh Steelers. Tim Tebow’s story this season has been exciting and even inspirational to watch. They (I) counted this guy out. We said he wasn’t good enough. We said he’d never achieve success. Well, he has proven us wrong and so we confess, Tim, you are still a lousy quarterback (the Bills—worst pass defense in the league—picked you four times! ), but you are a heck of a football player. Tim Tebow has worn his faith on his sleeve, or rather his face, since we began watching him at Florida. Every week we would see him propel his team to victory with his trademark kneeling (te)bow complete with John 3:16 (“For God so loved the world…) etched into his eye black. Today Tebow’s faith has become a source of pride for many Christians, and even a source of strength for others. Today we see Tebow win and we believe good wins, or at least God made the Broncos win! But I wonder when we jump to those conclusions if we are really thinking through what we are saying. If every time Tebow wins it is a sign of good winning, what does that say about the Bills when we lose? If God is really altering the course of a football game, why isn’t he altering this world of disaster and devastation? Tebow is great. I love seeing a young man unapologetic about his beliefs. Still, I fear the popular theology his fans come to believe. Job (capital J) was a blessed man. He had a great job (lowercase j), seven sons, and an overall fantastic life. People and Satan looked at him and thought “He has it made.” Satan even told God that it was no wonder Job had faith. God, he believed, was making life too easy for him. So God told Satan to take it away—take it all away. Satan would see then that Job had faith because of who God was not because of what Job had. And Job lost it all; his family, friends, job, and house. He cursed the day he was born. But he never lost his faith. The life of faith does not always mean a life of worldly blessings. The life of faith does not mean you will win football games against all odds. The life of faith does not mean that you will have a great job, seven sons, or a fantastic life. But the life of faith does mean that you will have life eternal. The life of faith does mean that you will have greater blessings; blessings like peace, hope, and gratefulness. The life of faith does mean an endless relationship with God our Father and Jesus our Lord. I’m glad Tebow won… because I don’t like the Steelers. If Tebow lost… that would be okay too. Because God is still with us. And whether or not Tebow wins a game, good always wins. So, Tim, I hope you won yesterday (because I don’t like the Patriots either). And, God, may your victory be made known in our hearts and in your hurting world—not on the gridiron. 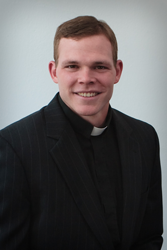 Pastor Shawn is a 2010 graduate of the Lutheran Theological Southern Seminary in Columbia, South Carolina, and he began his call at Hope Lutheran Church, Arcade NY that summer. While he spent four years learning and serving churches in South and North Carolina, as a Jamestown, NY native, Western New York has always been home. He is glad to be here. Pastor Shawn and his wife Carol Hannon met while attending SUNY Geneseo in the mid-2000s. They have enjoyed making their home together in Arcade with their daughters Quinn and Perry. Pastor Shawn has a background in youth and outdoor ministry. He is a former camper and staff person at Lake Chautauqua Lutheran Center in Bemus Point, NY. He has also served camps in urban settings and oversees in Madagascar. In seminary he was recognized for gifts in Greek and New Testament, and in his senior year was recognized with awards in both Preaching and Biblical Studies. Pastor Shawn continues to emphasize the youth in his ministry, but not simply because they are the future church, but because they are the church of today. He also enjoys working on service projects, and takes the role of planning meaningful and engaging worship seriously. He loves helping people find ways to put their passion and energy to work making their community and other people’s worlds a better place. When he is not working at church, Shawn enjoys remodeling and construction projects around his family’s home. But as busy as he gets, PS always has time for a quick nine (okay, 18) on the golf course. He enjoys playing sports of all kinds and fiddling with his guitar.